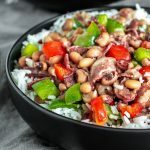 Instant Pot Hoppin' John is a quick and easy way to get all of the flavors of this classic southern recipe in less than an hour! Turn your pressure cooker to SAUTE. Add the olive oil and, once heated, add the onions and bell peppers. Cook until softened and set aside. Place dried black-eyed peas, bacon, chicken broth, bay leaves, garlic, and salt in the pressure cooker pot and stir together. Place lid on pressure cooker and lock in place. Turn pressure release valve to seal it. Set pressure cooker to cook on HIGH for 20 minutes. When the cooking time has ended let it do a natural release for 15 minutes. Then vent the remaining steam before opening the pot. Stir in the cooked onions and bell peppers and serve over cooked rice.